There are some incredible artists in Calgary and one, in particular, I have always wanted to meet is Amy Dryer. One day, on a whim, I contacted her in hopes she would humour me and possibly sit for a portrait. A week later, I found myself standing in her studio hashing out the details. We set a date in early September when new work for an upcoming show would be completed as this would set the backdrop for her portrait. As I do with anyone I photograph, I start with a simple conversation; no pre-set questions or expectations. I hope you enjoy some words about an artist named Amy. 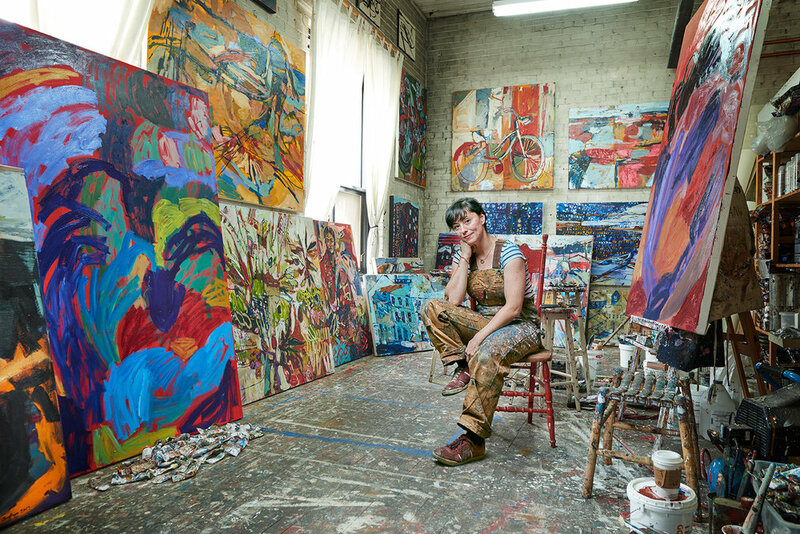 Amy’s studio is a visual experience all on its own. The entryway is aligned on either side with large vertical storage shelving that carries canvases as big as a human. The room opens unexpectedly where a fifteen-foot ceiling and large vertical windows stand tall, allowing beautiful north light to illuminate the space exposing the original brick walls and all its imperfections. The floor is covered in paint that can only be compared to a Jackson Pollock piece and there are paintings everywhere, randomly placed as if each one is fighting to be seen, if only for a second; you can almost smell the craft and process that hangs in the air. Amy apologizes for the mess but in my head, it’s a picture-perfect postcard of organized chaos, a space any artist dreams of. You can see Amy’s work at her new solo show titled Stella Polaris (The North Star) at the Masters Gallery which takes place on November 3-17, 2017. The opening is on November 4th from 11am-4pm and an artist talk the same day @ 1pm. If you would like to see the behind the scenes video, you can do so by watching below. And if you want to see more projects like this, feel free to subscribe as I'll be releasing them bi-monthly featuring some other projects that are currently in the works; I promise you'll only see the cool stuff.